Geoff and Donna Dean are our newest addition to Rock Church team. 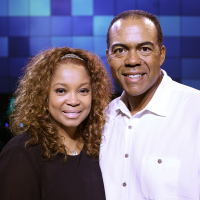 In 2014; Geoffrey and Donna where planted at Rock Church in Palm Desert, CA. Shortly thereafter, they were married by Pastor Eddie Elguera. Geoff & Donna enjoyed a wonderful season of leading a Connect Group from their home. This was indeed God’s promise and the next step towards the calling God placed on their life. Geoff alongside his wife Donna accepted the God-assignment of Children’s Ministry Directors for the Rock Church in July 2015. Together they have brought a great style of leadership to the Children's Ministry that is thriving. Donna Dean has been part of the Rock Church family since 1999. Donna served for many years in Children’s Ministry as a Lead Teacher, Children’s Drama Ministry Director and participated in several of the Adult Theatre Ministry productions at The Rock Church in San Bernardino, CA. Geoff and Donna are parents of three children and grandparents to a beautiful granddaughter.